Vegan crunchy nuggets made with naturally protein rich plant foods and organic herbs for adult dogs. 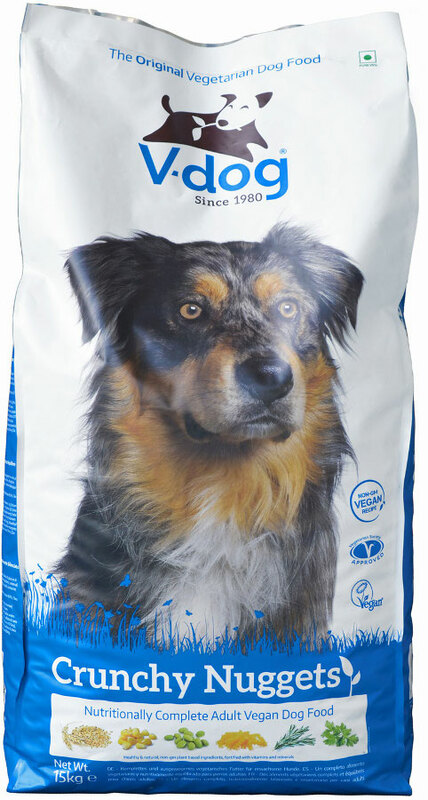 This vegan and vegetarian dog food contains Taurine and L-Carnitine supplements to help maintain a healthy heart. Free from GM ingredients, this vegan dog food is suitable for all adult dogs, and highly recommended for those with sensitive digestions, skin problems or suspected intolerance to meat proteins. Packaged in a plastic bag. Wheat, Maize, Soya, Wheatfeed, maize gluten meal, Sugar beet pulp, Sunflower oil, Rice, Pasta, Yeast, minerals, Linseed, dilcium phosphate, sodium chloride, Fructo-oligosaccharides, organic rosemary, organic parsley, Yucca extracts. Analytical Constituents: Crude Protein 20.0%, Fat Content 8.0%, Crude Fibre 4.0%, Inorganic Matter 8.0%, Calcium 1.0%, Phosphorus 0.8%, Moisture 8.0%. Additives per Kg: Antioxidants, Preservatives. Nutritional Additives / Kg: Vitamin A 18,000i.u., Calcitriol Glycoside 1,800i.u., Vitamin E 86.8mg, Vitamin B1 2.8mg, Vitamin B2 5.6mg, Vitamin B6 2.6mg, Vitamin B12 28mcg, B3 Niacin 28mg, B5 Pantothenic acid 21mg, Folic acid 1.4mg. Trace elements: Calcium Iodate Anhydrous 2.2mg (Iodine 1.4mg), Sodium Selenite 4.7mg (Selenium 0.21mg), Cupric Sulphate Pentahydrate 83mg (Copper 21mg), Ferrous Sulphate Monohydrate 232mg (Iron 69.5mg), Manganous Oxide 202mg (Manganese 125mg), Zinc Oxide 397mg (Zinc 289mg). Taurine 195mg, L-carnitine 100mg. 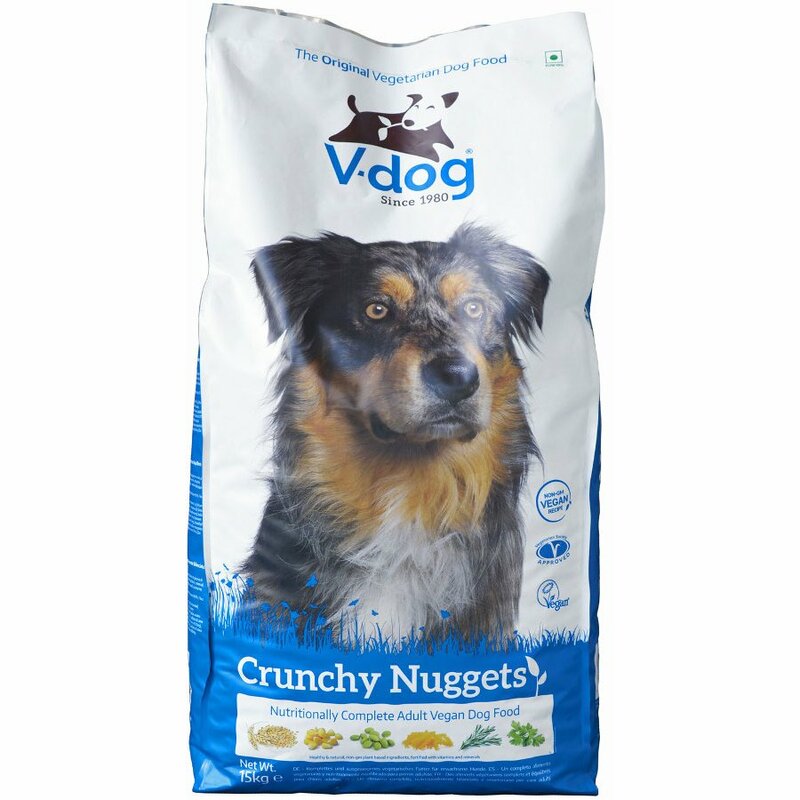 The V Dog Crunchy Nuggets - 15kg product ethics are indicated below. To learn more about these product ethics and to see related products, follow the links below. There are currently no questions to display about V Dog Crunchy Nuggets - 15kg.